559 mm, commonly known as "26 inch" with a decimal width designation, is the size used on "mountain bikes ", "comfort bikes " and "cruisers." These are not, however, the only options. There are 4 "650_" sizes in between these two extremes. In the French sizing system, tires are designated by a three-digit number, which may be followed by a letter. The number is the nominal outside diameter of the tire the rim was originally designed for. The absence of a letter indicated a narrow tire; "A", "B" and "C" indicated increasingly wider tires. "A" was originally a tire about 30 mm wide, so the 650A rim is pretty large, 590 mm. If you add the top and bottom 30 mm tire thickness to 590, you wind up with the 650 mm tire diameter. The 650C size was originally intended for a quite wide tire, about 40 mm wide. Top and bottom 40 mm tire plus the 571 mm rim size again bring you to a 650 mm outside diameter, even though the rim was smaller. With time, however, evolutionary processes have led to different widths of tires being applied to the rim, so the nominal 650 mm designation is now more theoretical than practical. We thank Aaron Goss of Aaron's Bike Repair for the photo below, a lineup of all four sizes. 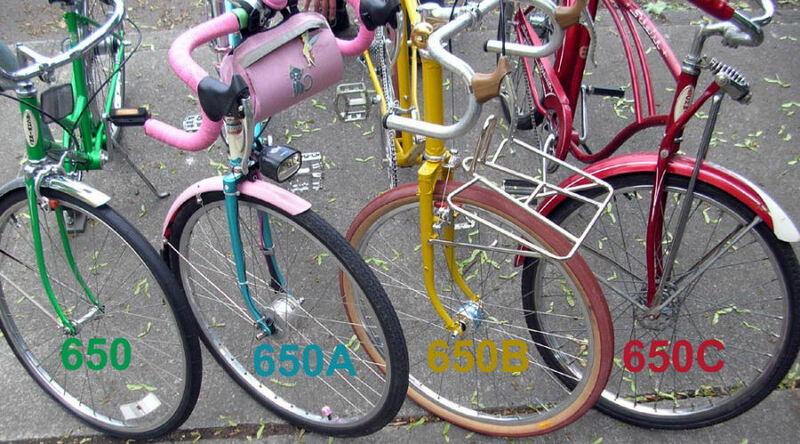 597 mm, 650, is the same as the British 26 x 1 1/4" size used on club bicycles, and was also adopted by Schwinn for use on 3-speeds with a 1 3/8" wide tire. This size is seen less and less, as the bicycles which use it become rare. 590 mm, 650A, also called 26 x 1 3/8", is the size used on the classic English 3-speed. There's nothing theoretically wrong with this size (other than confusion with the Schwinn size! ), but the selection of tires and rims available for it is pretty scanty these days in the USA. It is very popular in Japan. 571 mm, 650C, was originally a wide, balloon tire size, used on many older Schwinn cruisers, as in the photo. These days, however, it is mainly seen on triathlon bikes and time-trial machines. Available tires and rims are mostly very narrow, intended for competition use. 584 mm, 650B, is the focus of this article. This size, also known as 26 x 1 1/2", is most popular in France, where it was the traditional size for loaded touring bikes and tandems, as well as general utility bikes. The 650B size was never common in the U.S., and it went into decline even in France with the advent of the mountain bike. However, there is a dedicated group of fans of this wheel size, who have been diligently working to restore it to its former glory. The situation as far as tire and rim availability has lately taken a turn for the better, and the future looks rosy for 650B. Does it make sense to change wheel size on an existing bike? Sometimes it may. If you have a racing-type bike of good quality, but wish to make it more versatile, sturdy and comfortable, converting to 650B may be just the ticket. Newer racing bikes tend to have exceptionally tight tire clearance. Some of them can't even accommodate a tire wider than about 25 mm, and forget about installing fenders with any size tire! By switching to 650B from 700C, you suddenly gave clearance enough for medium-width tires, say 35-38 mm width, and for fenders, so you don't need to be a "fair-weather" cyclist. The wider tires will be more durable, more "sure-footed", and give a more comfortable ride on rough pavement or under moderate off-road conditions. Switching to 650B can also reduce front wheel/toe overlap issues. If you are going from a very narrow 622 (700C) tire to a fairly wide 584 (650B), the difference may be minimal. For instance, a 19-622 (700 x 19C) tire would theoretically have exactly the same outside diameter as a 38-584 (650 x 38B). 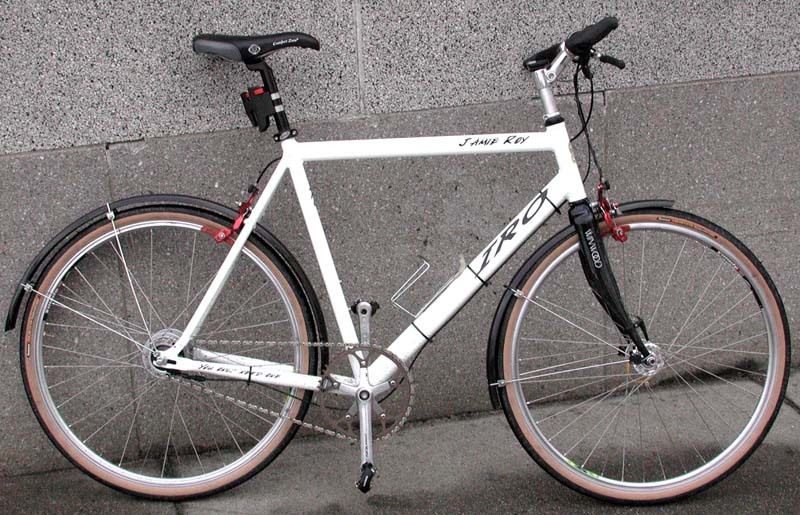 Click here to see more about my personal IRO Jamie Roy 650B conversion. The major obstacle to switching from 622 (700C) to 584 (650B) is the issue of brake reach. Since the 584 rim has a radius 19 mm smaller than the 622, you will need to replace your present brake calipers with some that have an appropriately long reach. How long a reach you will need will depend on the dimensions of your specific frame and fork. If you measure the reach with the original 622 wheels and add 19 mm to that value, this will tell you the brake reach required. BMX-type calipers and centerpull calipers will commonly have adequate reach for this application. Long-reach dual-pivot sidepull brakes also work. Another option is shown on my Home-Made "Drop Bolts" page. Some frames may have forks or rear stays that are too narrow to permit the use of wider 584 tires, but most often this won't be a problem, since the stays and fork blades get wider apart as they head toward the hubs. As if bicycle tire sizing wasn't already confusing enough, wrong-headed marketeers have recently tried to popularize a fourth designation for the 584 mm tire size! They are trying to get people to call it "27 five," as if it were halfway between the MTB "26-inch" and "29-inch" sizes. (Get it? "five" actually is supposed to mean "point five." Actually, this size is closer to the "26-inch" (ISO 559 mm) size than the "29er" (ISO 622mm) size, and even smaller than the "27-inch" (630mm ISO) size found on older road bicycles. I strongly urge readers to resist the foolish jargon, and to use either the traditional "650B" designation, or, better yet, the internationally-standardized 584 mm designation. In practice, there is an advantage, though, if you have a bicycle made for the fat, knobby so-called "27 five" tires, you can replace them with road tires if you prefer. A bicycle made for 584 mm road tires, on the other hand, may or may not not have clearance for the fat knobbies. Revised by John Allen, May 11, 2015.